The hospital in Kunduz after an alleged U.S. airstrike Saturday killed at least 19 people, including three children, according to officials with the international medical charity Doctors Without Borders, known by its French acronym MSF. U.S. Defense Secretary Ash Carter pledged on Sunday a full and transparent investigation of the U.S. airstrike at a hospital in northern Afghanistan that left at least 22 people dead on Saturday. That bombing triggered a firestorm of criticism from aid groups, including the international medical charity Doctors Without Borders, which operated the medical facility in Kunduz. Carter, speaking Sunday to reporters enroute to Spain, cautioned that the situation in Kunduz is "confused and complicated," while vowing that "we will get the facts." He also said he has ordered U.S. forces to provide any medical aid needed in the area. Carter spoke as Doctors Without Borders, known by its French acronym MSF, demanded an independent international probe of the bombing, which it said killed 12 hospital staff and 10 patients. Earlier Sunday, Afghan authorities said 10 to 15 Taliban fighters were hiding in the hospital and on its grounds. Hamdullah Danishi, the acting governor of northern Kunduz province, told the Washington Post: "we tolerated their firing for some time" before responding. But MSF, in a statement, said "not a single member of our staff reported any fighting inside the MSF hospital compound prior to the U.S. air strike, adding that "in any case, bombing a fully functional hospital can never be justified." An MSF spokeswoman said the organization has withdrawn from Kunduz, with all critical patients transferred to other health care facilities in the area. Doctors Without Borders described the airstrikes as a "sustained bombing" that continued for more than "30 minutes after U.S. and Afghan military officials in Kabul and Washington were first informed" of the airstrikes. MSF said the hospital "was repeatedly hit very precisely ... while surrounding buildings were left mostly untouched." It also said it had provided the GPS coordinates to "coalition and Afghan military and civilian officials" last week to avoid the hospital being hit. Doctors Without Borders, known by its French acronym MSF, said it has withdrawn from Kunduz. "All critical patients have been referred to other health facilities and no MSF staff are working in our hospital," said Kate Stegeman, the communications manager for Doctors Without Borders. She said some staff members are working in two area hospitals. Doctors Without Borders Staff in shock in part of the international medical charity's hospital in Kunduz, Afghanistan, that wasn't destroyed by an apparent airstrike, Oct. 3, 2015. The medical group demanded that an "independent international body" investigate the incident, saying that internal U.S. and Afghan probes "would be wholly insufficient." Doctors Without Borders described "sustained bombing" that continued for more than "30 minutes after American and Afghan military officials in Kabul and Washington were first informed" of the airstrikes. Meinie Nicolai, MSF president, has demanded "total transparency" from coalition forces. 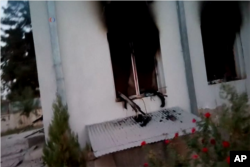 Associated Press video footage of the burned-out hospital compound in the east of Kunduz city allegedly shows automatic weapons on windowsills. U.S. President Barack Obama on Saturday offered his "deepest condolences to the medical professionals and other civilians killed and injured in the tragic incident." Afghan President Ashraf Ghani also expressed his "deep sorrow" over the killing and wounding of civilians, in a statement issued in Kabul. United Nations Secretary-General Ban Ki-moon and U.N. human rights chief Zeid Ra'ad Al Hussein called the airstrike "inexcusable." Zeid said, "International and Afghan military planners have an obligation to respect and protect civilians at all times, and medical facilities and personnel are the object of a special protection." He said, "if established as deliberate in a court of law, an airstrike on a hospital may amount to a war crime." Afghan troops, backed by U.S. airstrikes, have been engaged in heavy fighting in Kunduz against Taliban militants who took over the city earlier last week. Authorities in Afghanistan said Friday that at least 60 people have been killed and 466 wounded in the battle between government troops and the Taliban for control of Kunduz. A Taliban spokesman, Zabihullah Mujahid, in a statement sent to VOA, denied the presence of its fighters in the hospital at the time of the airstrike. In this photograph released by Medecins Sans Frontieres (MSF) on Oct. 3, 2015, fires burn in part of the MSF hospital in the Afghan city of Kunduz after it was hit by an air strike. Some material for this report came from Reuters.